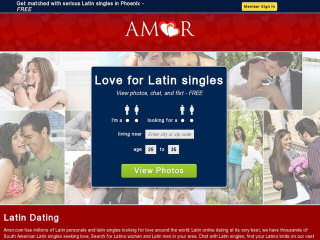 Amor is a personals site for Latin people, or those who want to meet someone of Latin background. There are around 78,000 active members on this pay site who're on the lookout for friendship, love or romance. There's a separate Latin gay community known as gay.amor.com. Amor is a place for Hispanic singles to meet, mingle and possibly fall in love. This online dating venue's aim it to connect single Latin women and Latin men who are looking for their compatible match. First and foremost it is a relationship site and it's open to people living anywhere in the world. The appearance of the site is fairly bland and generic. There's nothing that really grabs you other than it's stated aim of connecting Latin people for the purpose of love. You can get a quick preview by filling in the search box. You'll see a page of photos, although to go any further you'll need to take the plunge and register on the site. There's nothing that really stands out other than it's claim to connect Latin people for love. I found the registration process to be quick and simple with a few minor essay questions. You'll start with a guest account. This is really just to get you inside. It doesn't let you do very much other than create a photo profile and wait for people to contact you. The "Mingle" button is a quick way to get started. It shows you pictures of people you might like. Click yes or no to these and Amor will begin to learn which type of people you like. This information passes into the matching so that hopefully you'll be sent more appropriate matches. A membership upgrade will unlock full access to emails, chat rooms and use the high tech audio and video messaging features. I couldn't find an app for the site. However I found the website to work very well on my moble. Amor.com is a non-exclusive site that welcomes all peoples of all races and backgrounds who appreciate Latin culture. The detailed search feature allows members to find prospective matches in their same exact location or anywhere around the globe. Language options allow the site to be viewed in either English or Spanish. Rss Feeds. Subscribe to comments for this site. [?] Receive updates about Amor.com directly through your newsreader.